A forelimb prosthesis can be used to manage acquired amputations or congenital limb deficiencies of the front leg. A hindlimb prosthesis can be used for similar deficiencies in the hind leg. For acquired amputations, a longer limb length translates into a greater chance of success in fitting. A longer limb section means that there is more surface area to hold on to and to spread out the pressures in the device, and the amount of height being added to the bottom is reasonable for the dog to manage. In most cases, if the limb left is sufficiently long, the dog will try to touch it down to the ground (instead of holding it up towards the body) which makes learning to use a device that much easier. In the forelimb, amputations done at the carpal level and below are the most suitable for prosthetic fitting, though ones that are slightly higher (through the radius/ulna) may also be successful. In the hindlimb, amputations done at the hock level and below are the most suitable, with amputations though the tibia being possible but less likely to be successful. With anything higher than that there is a significant disadvantage of having much less limb to hold on to with the device, and a long, straight section of prosthesis that the dog will have to place and maneuver. Congenital limb deficiencies are similar in that having a long limb length is preferable. The atypical contours and angulation that are often present with congenital differences can be accommodated in the device and the support section below can be aligned to allow for the most stable weight bearing position. In the field of veterinary medicine, these amputation levels are not at all traditional, as most amputations are done at the shoulder or hip level. 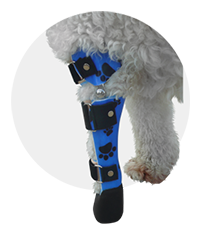 In some cases, it is certainly necessary to take the whole leg or a large part of it, but in others, the high level is done simply because the dog would likely try to use the remaining limb and could injure the tissue if it is not protected. The reality of prosthetic fitting for dogs has somewhat changes this protocol, but there are still three factors that must be considered before going ahead. The first being an injury or condition that allows for a lower amputation level; the second being a veterinarian who is willing to amputate at a lower level; and the third, an owner that is interested in having their dog fit with a device and who is prepared for the ongoing management of a dog with a prosthetic limb. The unknown variable is always whether the dog will take to the device and use it effectively, however if the level of amputation is sufficiently low and the device is supportive and comfortable, most dogs will adapt to using their prosthetic limbs.